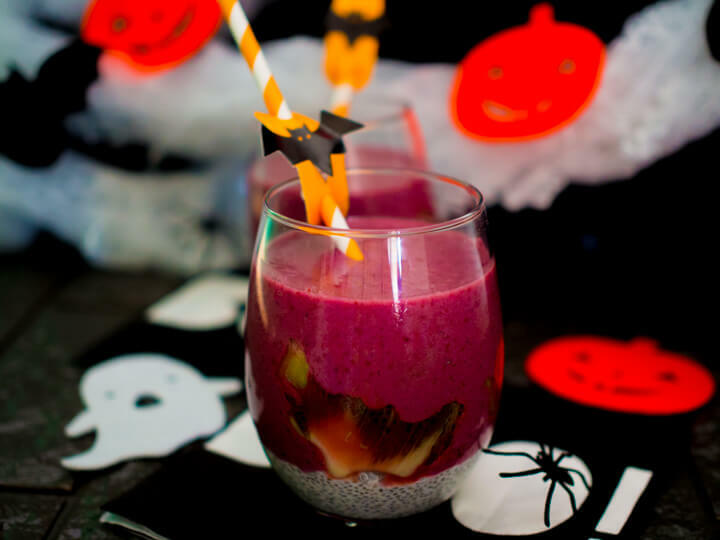 This witches brew breakfast smoothie may look spooky, but it’s super yummy, dairy free and full of good stuff! It’s also not too hard to make! But it looks super impressive. I made these for a bit of fun and used the cookies cutter I bought at Coles to cut out the bat shapes. They look like they take hours of work, right but the main time spent making them is the time they sit in the fridge while the chia seeds are absorbing the coconut milk. We don’t really do Halloween Downunder, but it is becoming more popular and that means that people are looking for Halloween treats. 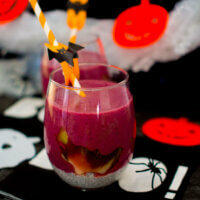 This witches brew breakfast smoothie isn’t really a treat- in fact it’s super healthy! It’s a fun way to bring some spooktacular fun to your Halloween! If you’re looking for something a bit more treat like, try these delicious chocolate swamp monsters! What other ways can we use chia seeds? You could actually make these smoothies the night before and as long as you cover them in the fridge they will be fine. This is not a freezer friendly recipe. 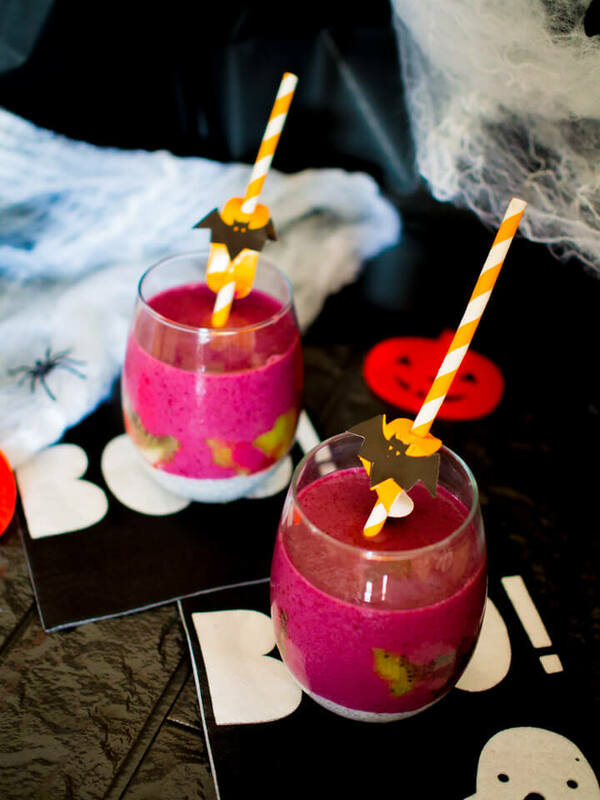 Witches brew breakfast smoothies...to help you have a spooktacular halloween. 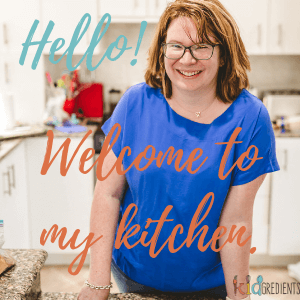 Dairy and gluten free and packed full of good stuff! Place 1/2 of the chia seeds in each glass. Divide 3/4 cup of coconut milk between the two glasses. Mix and leave to sit for 1 hour in the fridge. 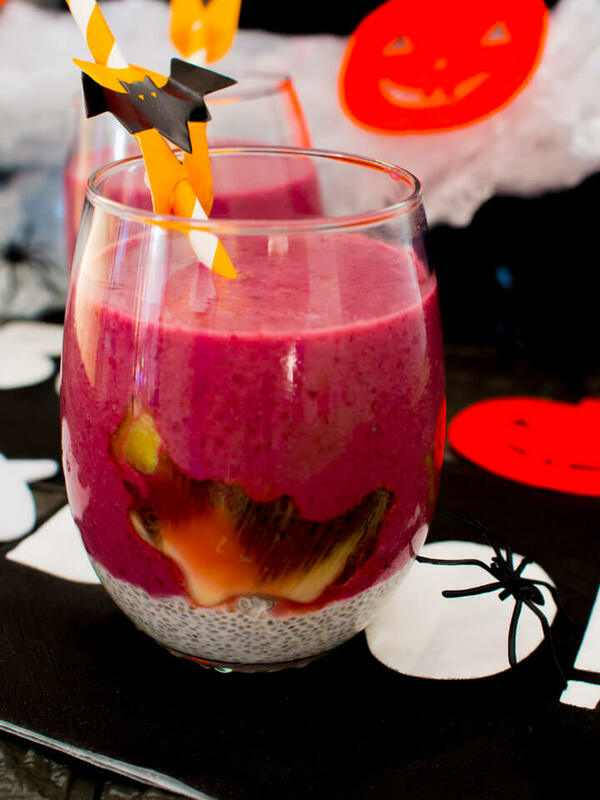 Cut the kiwi fruit in bat shapes and place in the glass on top of the chia seed mix. Blend the blackberries, banana and kiwi dregs with the water and remainder of the coconut milk. Pour on top of the chia seed mix and serve. 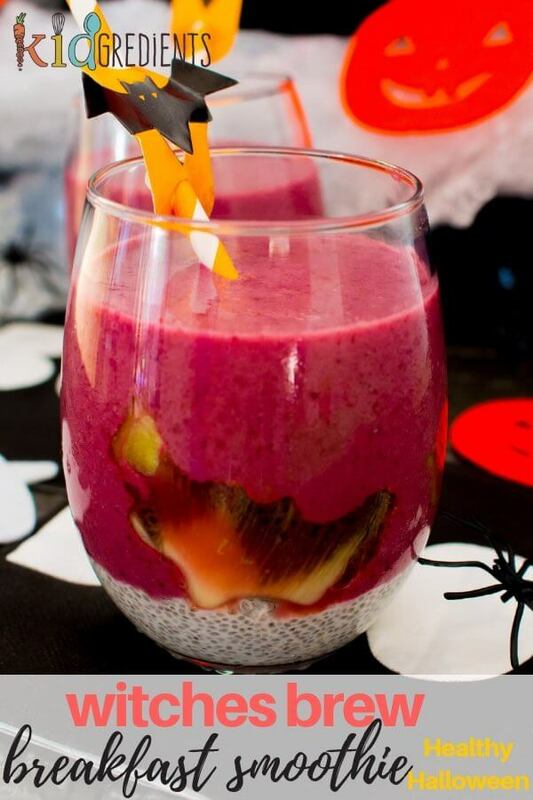 Love this healthy smoothie with a Halloween feel. It’s a great way to feed the kids something wholesome before the candy onslaught! Thanks Colleen, yes we don’t really do Halloween here, so these are a bit of fun! I don’t know if it is spooky or not, but it really looks like a dang delicious breakfast smoothie. Oh so yum! This is a very healthy and colourful looking smoothie, I like it! It definitely nails the ‘Halloween brief’ but it also ticks the ‘healthy box’ . I like the effort you have gone to in sticking with the theme!